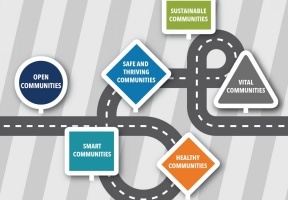 Under the leadership of Cook County Board President Toni Preckwinkle, the Offices Under the President (OUP) has published the executive summary of the Cook County Policy Roadmap, OUP’s strategic plan, for public comment. 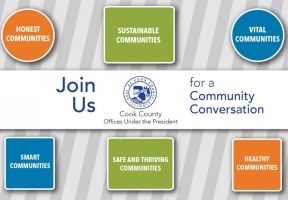 OUP is asking residents to join an Open House to learn about and discuss Cook County’s Policy Roadmap and the priorities that will guide this five-year strategic plan. Residents can review the executive summary online at www.cookcountyil.gov/service/policy-roadmap. They can submit written comments online or in person at an Open House. Subject matter experts will be present and available for interviews as needed. Sept. 13, 4 p.m. to 7 p.m.
Sept. 20, 4 p.m. to 7 p.m.
Sept. 25, 4 p.m. to 7 p.m.
Sept. 26, 2 p.m. to 5 p.m.
Sept. 27, 4 p.m. to 7 p.m.